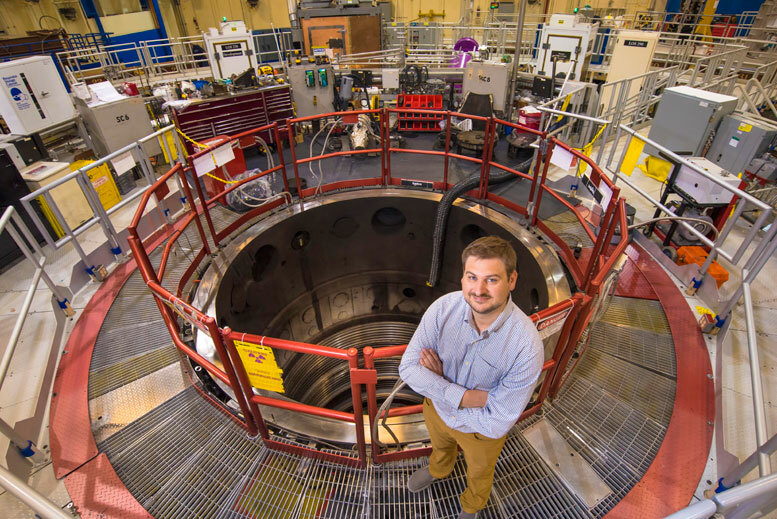 Hands-on experiments performed at Sandia National Laboratories’ Z machine contradict a long-standing but unproven assumption about the X-ray spectra of black holes. Z, the most energetic laboratory X-ray source on Earth, can duplicate the X-rays surrounding black holes that otherwise can be watched only from a great distance and then theorized about. The results suggest revisions are needed to models previously used to interpret emissions from matter just before it is consumed by black holes, and also the related rate of growth of mass within the black holes. A black hole is a region of outer space from which no material and no radiation (that is, X-rays, visible light, and so on) can escape because the gravitational field of the black hole is so intense. Most researchers agree a great way to learn about black holes is to use satellite-based instruments to collect X-ray spectra, said Sandia co-author Jim Bailey. “The catch is that the plasmas that emit the X-rays are exotic, and models used to interpret their spectra have never been tested in the laboratory till now,” he said. The divergence between theory and reality began 20 years ago, when physicists declared that certain ionization stages of iron (or ions) were present in a black hole’s accretion disk — the matter surrounding a black hole — even when no spectral lines indicated their existence. The complicated theoretical explanation was that under a black hole’s immense gravity and intense radiation, highly energized iron electrons did not drop back to lower energy states by emitting photons — the common quantum explanation of why energized materials emit light. Instead, the electrons were liberated from their atoms and slunk off as lone wolves in relative darkness. The general process is known as Auger decay, after the French physicist who discovered it in the early 20th century. The absence of photons in the black-hole case is termed Auger destruction, or more formally, the Resonant Auger Destruction assumption. However, Z researchers, by duplicating X-ray energies surrounding black holes and applying them to a dime-size film of silicon at the proper densities, showed that if no photons appear, then the generating element simply isn’t there. Silicon is an abundant element in the universe and experiences the Auger effect more frequently than iron. Therefore, if Resonant Auger Destruction happens in iron then it should happen in silicon too. That deceptively simple finding, after five years of experiments, calls into question the many astrophysical papers based on the Resonant Auger Destruction assumption. 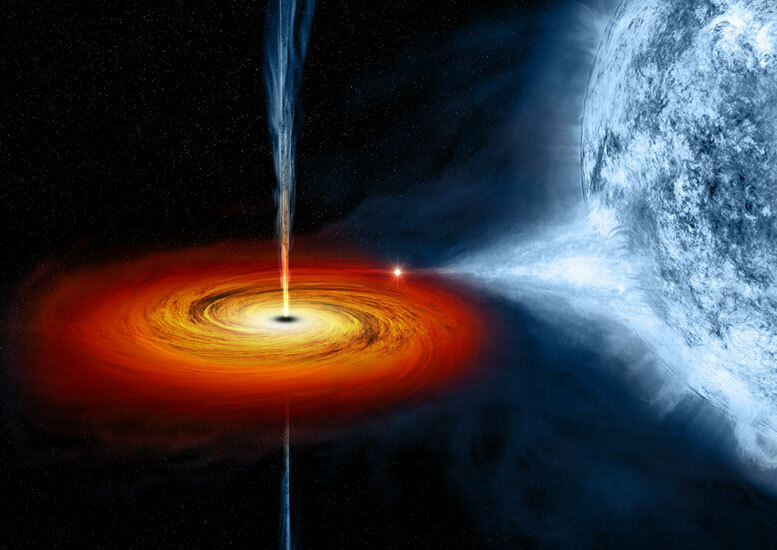 The Z experiment mimicked the conditions found in accretion disks surrounding black holes, which have densities many orders of magnitude lower than Earth’s atmosphere. The reason accurate theories of a black hole’s size and properties are difficult to come by is the lack of first-hand observations. Black holes were mentioned in Albert Einstein’s general relativity theory a century ago but at first were considered a purely mathematical concept. Later, astronomers observed the altered movements of stars on gravitational tethers as they circled their black hole, or most recently, gravity-wave signals, also predicted by Einstein, from the collisions of those black holes. But most of these remarkable entities are relatively small — about 1/10 the distance from the Earth to the Sun — and many thousands of light years away. Their relatively tiny sizes at immense distances make it impossible to image them with the best of NASA’s billion-dollar telescopes. While Loisel is ready to say R.I.P. to the Resonant Auger Destruction assumption, he still is aware the implications of higher black hole mass consumption, in this case of the absent iron, is only one of several possibilities. “Another implication could be that lines from the highly charged iron ions are present, but the lines have been misidentified so far. This is because black holes shift spectral lines tremendously due to the fact that photons have a hard time escaping the intense gravitation field,” he said. There are now models being constructed elsewhere for accretion-powered objects that don’t employ the Resonant Auger Destruction approximation. “These models are necessarily complicated, and therefore it is even more important to test their assumptions with laboratory experiments,” Loisel said. The work is supported by the U.S. Department of Energy and the National Nuclear Security Administration. Be the first to comment on "Hands-On Tests at Sandia’s Z Machine Contradict Black Hole Models"